Writing about music is akin to dancing about architecture, or snowboarding about photography – no matter how good the writing, dancing or snowboarding, most of what is trying to be conveyed will inevitably be lost in translation. Alex Ross, a frequent contributor to The New Yorker, does a better job than most of putting something meaningful about classical music down on a page. 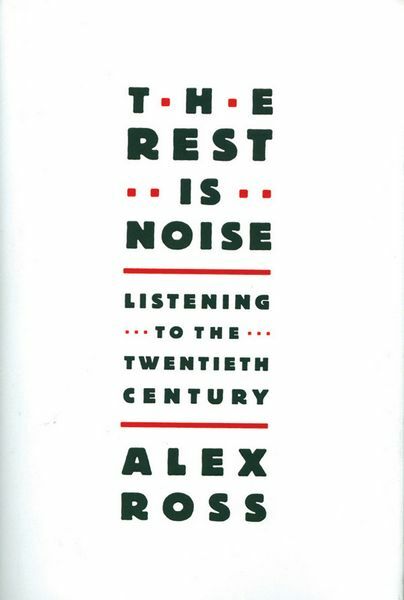 Make that 543 pages in the quixotically ambitious “The Rest Is Noise: Listening to the Twentieth Century,” a survey of music composition from Richard Strauss to John Cage. Ross’ description of the final works of Bela Bartók – “strings whip up dust clouds around manic dancing feet,” “drums bang the drunken lust of young men,” “as if the composer, who had observed peasants with shy detachment, were finally throwing away his notebooks and entering the fray” – gives a useful, even palpable sense of Bartók’s folk-oriented work, even if it doesn’t conjure even a single note for one unfamiliar with the music itself.Ross overestimates the effectiveness of the written word in describing music. Too often in “The Rest Is Noise,” Ross’ accounts add up to very little, especially so in the handful of operas that seem to mark the height of recent musical achievement, and which Ross describes meticulously: Strauss’ “Salome,” Gershwin’s “Porgy and Bess,” Shostakovich’s “Lady Macbeth of Mtensk,” Adams’ “Nixon in China.” The descriptions are unnecessary for the well-informed, who can refer to the music itself, and futile for the uninitiated, who have few reference points.Fortunately, the bulk of the book is devoted not to the music itself, but where the music came from – the historical context, the personalities of the composers, the technological changes. The circumstances in which Shostakovich wrote his Seventh Symphony (as German bombs rained down on Leningrad), or Messiaen his “Quartet for the End of Time” (while imprisoned in a Nazi camp) illuminate the creative impulse to respond to life with music.”The Rest Is Noise” is especially powerful in tracking the course concert music has taken over 100 years’ time. He traces the push-and-pull, and the occasional revolutionary overhaul brought on by a Stravinsky or Schoenberg, that brought us from Mahler’s statement that “a symphony should contain everything,” to the conceptualist John Cage, whose “4’33″” was four-plus minutes of silence. Ross sees no downward spiral from the time when the Viennese greeted their greatest celebrity with screams of “Der Mahler!” to an America where the term “famous composer” is an oxymoron. Optimistically, he finds traces of the classical in the Velvet Underground, Radiohead and Public Enemy, whose “Welcome to the Terrordome” he calls “the ‘Rite of Spring’ of black America”Between those extremes is a universe of styles, ideas and sounds that echo two World Wars, the battle between communism and democracy, the invention of the phonograph, the evolution of jazz and rock. Occasionally, Ross writes some magical words that get a reader closer to a sense of those sounds. But always, he throws light on what it was that produced that music.